The rains have really arrived now, and the sun is hanging low in the sky even at midday. But the temperatures are still mild and the soil life is still active, so things are still growing, just more slowly. We have a more fall-ish share this week, with a few summery holdouts. Potatoes make a return with the fingerling variety “Laratte.” New this week is a large purple top turnip. Also in the root section this week we have carrots. See the recipe below for a potato, turnip, and carrot dish. These might be the last large carrots you see for the year. I have one more planting in the field, but I planted it pretty late and so the carrots are pretty baby-sized and may not get much bigger. 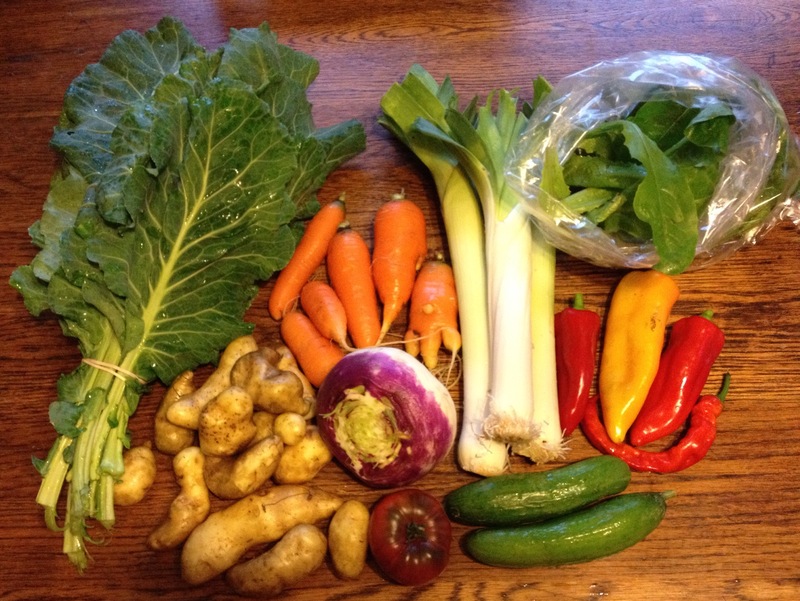 Rounding out the fall veggies this week are collard greens and leeks. Then we have a few summery holdouts: the cucumbers and tomatoes from inside the warm confines of the sealed up hoophouse, and the sweet peppers from the field (they hold up ok to these wet mild days). Finally on the salad front Monday folks got a bag of mixed lettuce greens. I think Thursday folks will get something different for a salad green instead, as this lettuce barely looked ok enough for Monday: lots of bugs, slugs, yellow leaves to pick out, etc etc. The crimson clover cover crop is sprouting nicely, and at least in one spot where we got it in early has created a nice thin green blanket over the brown soil. It gives me a lot of joy to see cover crops sprouting and growing in the fall. Since it is a season mostly of seeing crops die or be turned under, it’s nice to have at least something getting a fresh start. And it’s lovely to look at and know that it will help protect the soil from the heavy winter deluges. Not to mention that it will potentially add a lot of nitrogen to the soil after it’s cut and tilled in just before full flowering in the spring. There are still a few places to plant cover crops, but at this point it’s too late for crimson clover so I’ll plant a rye & vetch mix, which can germinate in colder temperatures. Peel and thinly slice the potatoes and turnip and peel and slice the carrots. Toss them with the heavy cream, ⅓ of your Parmesan cheese, thyme, salt, and pepper. Layer them in a pretty pattern in the greased (with Pam) baking dish, however it fits. I used a 9×9 casserole dish for mine. Pour the onion and garlic mixture over everything. Top with the Parmesan cheese. Bake for 45 minutes to 1 hour, until browned and bubbly. Let sit for 5 minutes, top with chives, and serve. Sprinkle with chives or scallions, if you like. Serves 6 as a side.